As you travel the beautiful Hana Highway through Maui's untouched rainforest, you will be surrounded by breathtaking views, majestic werfalls and a lush tropical landscape. Your journey ends as you reach the town of Hana . HERE IS UNSPOILED HAWAII, where you can relax and enjoy the true spirit of Aloha. The Hana Kai-Maui Resort gives you a place to dream, rest and rejuvenate, first hand, with the comforts of home in 17 WELL-APPOINTED APARTMENTS. The sound of the Pacific out your windows—ONLY 100 FEET FROM THE WATER'S EDGE—soothes away all thoughts and concerns. It is one of “Heavenly Hana’s” hideaways, SITUATED CONVENIENTLY AT THE EDGE OF TOWN OVERLOOKING HANA BAY. The Hana Kai-Maui Resort was built in the 70’s as an inn by the sea. With renovation and new life breathed into this property, it has become one of the best little finds in all of Hana. We offer FIRST CLASS STUDIO, ONE AND TWO-BEDROOM ACCOMMODATIONS that feature exquisite grounds, beachside barbeque, FULLY EQUIPPED KITCHENS, PRIVATE LANAIS, and FREE WIRELESS INTERNET SERVICES. Our resort has PANORAMIC OCEANFRONT VIEWS, where you can experience incredible sunrises and moonlit nights while turtles and dolphins swim nearby in the surf. A spring-fed koi pond and lush, tropical grounds add to the simple luxury of your stay at Hana Kai-Maui Resort. The Hana coast offers some of Hawaii’s most beautiful, intimate beaches. From the black sands of Wainapanapa State Park to world famous Hamoa Beach, you can enjoy swimming, snorkeling or surfing close to your doorstep. There are many hidden places for you to explore. Just eight miles away, the pools at Oheo Gulch (“seven pools”) offer great scenery and refreshing swimming in Haleakala National Park-Kipahulu. Hikers will enjoy a panoramic hike up through the bamboo forest to Waimoku Falls. The trails at Wainapanapa will bring you to fresh-water caves or take you along the coast to spectacular views where you can sometimes see humpback whales as you hike along the cliffs. Fill your day with a stroll along the beach, or find a quiet place to sit and enjoy the unspoiled beauty. Available nearby amenities include kayaking, horseback riding, tennis, dining out or a relaxing in-room massage. The staff at Hana Kai-Maui is here to serve you from 8am - 8pm daily; providing DAILY HOUSEKEEPING SERVICE, and our ON-CALL MANAGER is always available if assistance is needed after hours. We are happy to offer you OVERNIGHT ACCOMMODATIONS, something rarely found in Hana, although we warn you that most people wish they had stayed at least two nights. Our view categories include partial oceanview, oceanview and oceanfront. We offer studio, 1 bedroom/1 bath, 2 bedroom/2 bath condominiums with rates ranging from $230-$495 per night. Beautiful, manicured grounds, renovated apartments with full kitchen, daily housekeeping, friendly staff. Cleanliness is our top priority. Unmatched views of Waikaloa with hundreds of coconut trees. Sleep to the soothing sound of the ocean washing over the pebble beach. Each unit is individually owned and unique in decor. Owners work together to keep a high uniform standard in each room. All units have full kitchen, 100% cotton 400TC linens, high quality locally made amenities, spacious covered lanai. Naturally cooled by our ocean breeze. Free local phone calls, free wifi, in-room safes. Mountain view can also be seen from the lanai. Free local calls. Long distance calls require a prepaid phone card. Best cell service is through Verizon. At&t is spotty. Sprint has no service in Hana. Available for guest use between the hours of 8 & 10AM, and 3 & 7PM for a fee of $12 includes wash, dry & soap. Full laundry service @ $20/load washing, drying, folding and delivery to room. Free off street parking, usually just a few steps from your unit. Wireless Internet is available provided you bring your own laptop. 1 bedroom units have a spacious living room. Studio units have a small seating area. Service for 4 or 6, wine glasses, measuring cups/spoons, cooking utensils, etc, etc. Full kitchen including 4 burner stove w/ oven, refrigerator, micro, toaster, coffeemaker, pots/pans & dishes. Very well stocked. Dining Bar with 4 chairs within unit. Also dining table and 4 chairs on lanai. Beautiful grounds for all to enjoy. We have an herb garden. Our BBQ grill is located in the common area downstairs on the ocean lanai. We even have a small fresh herb garden on property. Daily housekeeping service is provided. 400 thread-count 100% cotton sheets, All-natural shampoo, conditioner, hand soap & bar soap, toilet tissue, facial tissue, paper towel,coffee, nondairy creamer & sugar, salt & pepper grinders, cooking spray, foil, saran, brita water filter pitcher, hair dryer, iron/ironing board, fresh herb garden, outside shower, beach towels, board games, free private parking, in-room massage by independent licensed therapists. We absolutely fell in love with this condo the second we walked in! Clean, beautifully decorated, had everything we needed and those views! It’s such a private unit on the corner with views everywhere you look. Great sized balcony with its own private path/entryway to the grounds. The most incredible sunrises we’ve ever seen. Don’t miss them! You can watch it from any window if you don’t feel like getting outside, but you will ;) with so many beautiful sights so close, it was conveniently located for adventures. Can’t wait to stay here again! Unit 1 is on a corner with a spacious porch overlooking the grounds and beach, it feels like a home! Spacious and complete kitchen. All the comfort and space we needed. Close to all in Hana. We strongly recommend. My husband and I stayed here for 3 nights in January, and when I walked into the unit, I was beyond thrilled with both the condo and the view (we stayed a 1 bedroom oceanfront unit). It was gorgeous! Everything is beautifully updated, clean, and comfortable, and the view is like a postcard! I would stay here again in a heartbeat. The staff was very friendly, the location was close to all the things we wanted to see, and I felt it was a good value for what we paid. Loved it! We rented all the rooms at the Hana Kai Maui for my son's wedding and we can't say enough good things about this very special place. First, the site on the black sand beach is one of the best I've ever seen, no structures visible from the patio and lawn, just a tropical paradise. Secondly, the rooms are all different and nice, and the grounds are so lovely, koi ponds, small waterfalls, and tropical plants. We gave all 42 guests continental breakfast every morning in their nice patio, which I prepared in our exquisite 2 bedroom condo. The first of the 3 nights spent there we had a barbecue cooked at their grill on the patio. This patio was a perfect place for all to meet and enjoy each other and the spectacular views. The large grass yard was ideal for the wedding. Of course the wedding co-ordinator bought all the food we needed and worked closely with the hotel staff to make sure everything went smoothly on the wedding day, and it did. The staff were so nice and easy to work with and you could tell they wanted to make this a very special time for us. It couldn't have been better. This is truly a unique location because it's in a residential neighborhood so you feel like you could be tucked away in your own secluded home. We had organized hikes to waterfalls and the seven sacred pools. This happened two weeks ago and friends and family are still calling to say they had so much fun in this wonderful spot in paradise. This location has it all. Breath-taking views, luxurious accommodations, and location-location-location. The view off the balcony/master bedroom along with the sounds of the ocean was hypnotic. I stared out the sliding doors while still in bed or from the balcony furniture. If a shower blew through, we went into the living room and watched. NO TV, NO intrusion, just extraordinary views, sounds, and The Trades. Cozy parking but then, Hana is 'cozy'. So, add a little planning and all goes well. Our previous living experience was on another part of Maui...gentle waves, slight sound...nice but mundane. But HERE... it is altogether different. There is much more surf, sound, crackling rock beach, black crabs, spouting horns...if you know where and when to look...sensory overload...almost. Cameras (still and video) a must--especially before a shower rolls in. Sunrises, back lit surf, white crested blue water curls with back lit offshore winded spray, black beach, white foam breakers crashing on the beach followed by the settling pebbles...sounds like applause for a well placed wave. Other than the white knuckle drive from the airport, the proximity to Haleakala Park, road side fruit stand and a tent cafe made the trip worth all the nail biting hairpin turns. If ever one could describe a beautiful reward at the end of an arduous journey, THIS is such a reward. We are already planning a return visit to this unit as it was such an overwhelming surprising delight. Do your homework if you must, but you will not be disappointed with your decision to stay at the Hana Kai Maui. I couldn't have said it better myself! 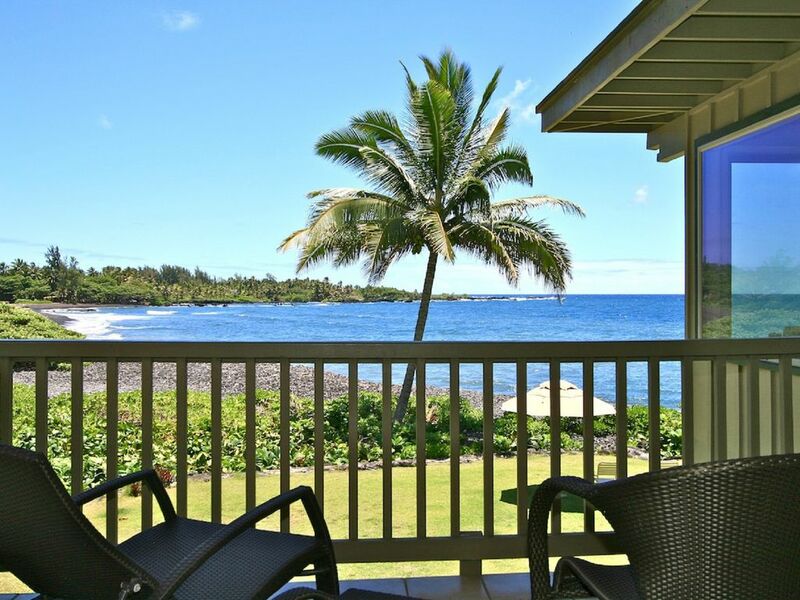 Our guest is referring to unit #5, appropriately named "Kaahumanu", 2BR/2BA Oceanfront unit. Kayak on Hana Bay, Horseback riding, hiking, swimming all within walking distance of Hana Kai.